Get Ready for the Mogolympics! But that isn’t what I really wanted to talk about. That’s right, it’s time for the Mogolympics! JD over at Amateur Azerothian had this great idea for a transmog contest to coincide with the 2012 Summer Olympics in London. And I’m going to be one of the judges! I can’t wait to see all the fabulous outfits that you guys come up with. There’s already a ton of amazing bloggers and transmog fans signed up, but there’s no limit to the number of competitors, so don’t hesitate to sign up. **Edit: I forgot to mention, the deadline for the submission of entries is July 31st. But make sure you let JD know you plan on entering so that he can assign you a faction for your flagbearer! 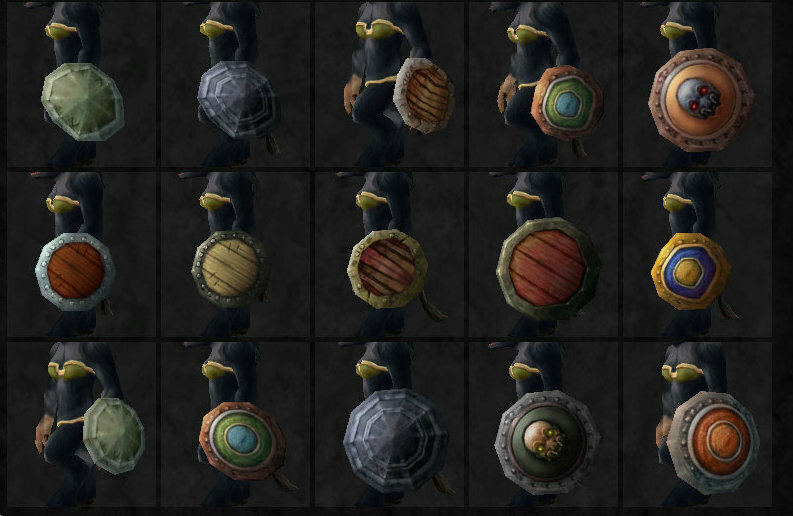 Discus – Build an outfit around one of the shield skins seen here. …if you receive Sporeggar, your flagbearer’s outfit would include their tabard. Let me clarify, though, this is the only outfit where you’re required to use the colours of your faction. This is also for appearance only, there’s no medal for this portion of the Mogolympics. The main reason is some will have an easier time than others because of tabard diversity. There is NO limit on the number of participants. 9 competition outfits. At least 5 different races must be used, never repeating the same gender/race combo (if you use Blood Elf Male for Javelin, you can’t make a Blood Elf Male for Discus. You could however make it female so long as you aren’t submitting a Blood Elf Female in any other event). Your flagbearer combo may be used in a competition event. Include the gear you used for each outfit please (the judges can peg many articles from in-game, but can’t always tell what everything is). MogIt and ModelViewer entries are welcome. We’ll reveal three events a week for three weeks, beginning August 12th. Medals will be handed out accordingly. I have set no criteria for fellow judges. They will simply give their rankings based on their own thoughts. However, they’ll not know who they’re voting on (it will be labelled as Outfit D, rather than “Tome,” for example). The winner will have received the most medals in the nine events. For more details and clarifications, or to see the list of entrants, head on over to JD’s Transmogolympics page. I hope to see you all there! Glad your move is behind you and you’re settling in. We are going to have lots of hard judging to do! Oh, I know! And to think that I thought judging would be LESS work! D: I can’t wait to see all the entries though!